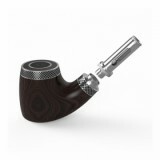 VapeOnly III Ebony E-pipe Starter Kit comes with an E-pipe shape and a single built-in 18350 battery. Inspected from the raw material to the end product, it remains guarantee for you. Air activated design will allow you free you hand and enhance your experience when you are vaping. 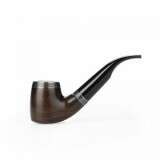 Here comes the VapeOnly III Ebony E-pipe Starter Kit, whose body is made of ebony wood by delicate handcraft. It will make you feel comfortable in hand. Inspected from the raw material to the end product, VapeOnly III Ebony Kit remains guarantee for you. By the working of single 18350 battery, it can produce great flavor for you. Moreover, it is air activated, which allows you free you hand when you are vaping. Three levels of voltage mode are available for you to meet your different demand. 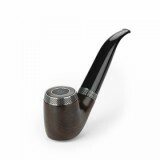 Come and buy one VapeOnly III Ebony E-pipe Starter Kit and start to enjoy your Ebony vaping. • You may have interest in other E-pipe Kit like VapeOnly vPipe 3 e-Pipe Kit. • VapeOnly vPipe III Ebony e-Pipe Body is also available in BuyBest.